At 9:00 this evening I found myself, in a dress and heels, standing at the counter of Petco ordering One Large Cricket. The boy cashier eyed me skeptically. The cashier then calmly stated into the loudspeaker, “One large cricket, please. One large cricket.” The request echoed throughout the store, reminding me so much of a burger joint, I wondered if you could order by number (Value Meal #1: One large cricket, two small worms and a Coke…) I was impressed when one minute later, a tiny woman emerged from the back of the store through the crowd, delivering the product to me with a big smile. Efficient, that Petco. As my order was placed over the intercom, laughter erupted in the line. I didn’t see what was so funny, until later Derrick explained to me that they sell crickets in bulk for reptiles to eat, so a customer purchasing just one was a bit of a spectacle. Somehow this did not occur to me at the time of purchase. 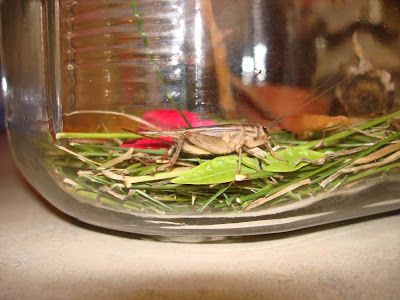 I just assumed Petco sold crickets for one purpose only: every nine-year old girl needed her own cricket named Lucky to take in a jar to school for Insect Day. Why else would they keep thousands of crickets in stock? The upside of tonight’s rather embarrassing display was that it gave me a brief respite from a psuedo-fancy dinner at the Red Lion that was agony. It was one of Derrick’s business thingys complete with a two hour program and slide show–need I say more? You’ve all been to them. At 8:35 I remembered the promised cricket would only be available until 9:00 (when Petco closes) so I had to jump up and run out on the show. I made it to the car and peeled out before the evil speaker could drag me back in with his long cane. Thank you, Lucky! You’re a good story teller Jen.